Vientiane has again topped the list of road accidents around the country over a two week period, with 66 recorded accidents and nine fatalities. A report from the Traffic Police Department of the Ministry of Public Security provided figures from December 29, 2016, to January 8, 2017. In Vientiane, 66 accidents were recorded, 93 people were injured and nine people died. 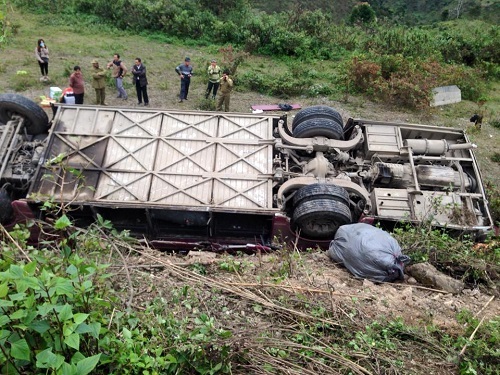 Second on the list was Champassak province which reported 36 accidents and four fatalities. Third was Savannakhet province with 30 accidents and nine fatalities. In contrast, Xaysomboun province did not report any accidents or fatalities. The department’s report revealed that 300 road accidents occurred across the country, resulting in 51 fatalities. In total, 83 people were left in a critical condition, 150 were seriously injured and 188 people were slightly injured. Eighteen vehicles were written off, 279 sustained moderate damage and 245 vehicles sustained minor damage. Laos has a high rate of road accidents compared to other countries in the region with motorbikes involved in 95 percent of all vehicular accidents and males making up 90 percent of the fatalities. About 90 percent of accidents involve drunken driving, speeding and other violations of the traffic rules. Many accidents occur on weekends and special occasions when people get together to drink alcohol. In an accident that occurred in Vientiane on Sunday, a car and a motorbike were involved in a fatal collision in Xaysavang village, Xaythany district. The motorbike rider died instantly but the suspect car drove off. The Vientiane Traffic Police Department is now trying to trace the driver. Another accident occurred in Km8 village in Hadxaifong district, when a pickup lost control, hit a motorbike and overturned. The motorbike rider was killed and a passenger sustained injures. Police are investigating the incident. What Is First Aid In Laos ?